Park West Radiology is part of Lenox Hill Radiology’s network of 25 outpatient radiology centers in the New York Metropolitan area. 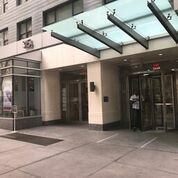 Located on 315 W. 57th Street Manhattan’s west side, Park West radiology offers a complete range of imaging services, including, MRI (3T wide-open), MRA, CT, mammography, ultrasound, musculoskeletal ultrasound, digital X-Ray, and DEXA for bone density measurement. Located between 8th and 9th Avenues, Park West Radiology is just a few blocks away from Central Park and Columbus Circle. The center is easy to get to by train or bus. By train, take the N, Q, R train to 57th Street and 7th Avenue or take the A, B, C, D, 1 train to 59th Street, Columbus Circle. By bus, take the M104 to 8th Avenue and 56th Street. At Park West Radiology, our combination of dedicated specialty physicians, friendly compassionate staff and cutting edge technology allow us to offer our patients only the very best in diagnosis, management, follow up and care. Contact us to find out more about our services and convenient appointment times.